This week, some of the world’s top scholars will look to Stockholm and Oslo as the 2012 Nobel Prizes are announced. 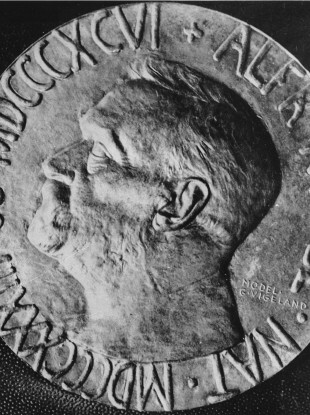 Photo of the Nobel Peace Medal taken on December 3, 1957. SOME OF THE world’s top scholars will be thrust into the global spotlight this week as award committees in Stockholm and Oslo announce the 2012 Nobel Prizes, starting with the medicine award Monday. The prestigious prizes, created by Swedish industrialist Alfred Nobel, were first awarded in 1901 to honour ground-breaking achievements in medicine, physics, chemistry, literature and peace work. The Nobel Foundation this year lowered the prize money 20 per cent to 8 million Swedish kronor, citing turmoil on financial markets. All prizes will be handed out 10 December, the anniversary of Nobel’s death in 1896. Email “Nobel Prize season kicks off with medicine award ”. Feedback on “Nobel Prize season kicks off with medicine award ”.